A recipe for a gingered butternut squash tart. The tart has a crust made with crushed ginger snaps and a filling of cooked butternut squash, ginger, and cinnamon. Preheat the oven to 350 degrees F. Lightly grease an 11-inch tart pan with a removable bottom (or use a non-stick cooking spray). In a food processor fitted with the knife blade, combine gingersnaps and sugar. Process until finely ground. Add melted butter and pulse until crumbs are moistened. Transfer moistened crumbs to the tart pan. Press into the bottom and partially up the sides. Bake crust for 8 minutes or until lightly browned. Cool crust completely. Slice squash in half lengthwise. Scoop out and discard seeds and stringy flesh. Place squash halves cut side down in a large baking dish. Add about 1/2-inch hot water to the dish. Cover with foil and bake for 45 minutes or until tender. Drain and allow squash to cool to room temperature. Scrape out the flesh into a bowl and discard skin. Mash squash or beat squash thoroughly until smooth. Measure 2 cups of mashed squash and place it in a large bowl. Store remaining squash in the refrigerator for other uses. Add sugar, ginger, cinnamon, salt, evaporated milk, and eggs to the bowl. Stir to thoroughly combine the ingredients. Pour mixture into the crust in the tart pan. Bake for 40 minutes, or until lightly browned and the center of the tart is set. Cool completely on a wire rack. Remove tart from the pan and place on a serving platter or cake stand. If the tart does not easily come out of the pan, use a butter-type knife to separate the edges of the tart from the pan first. Poke the knife down in the curves of the edge between the pan and the tart. 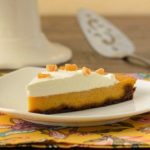 Top tart with whipped cream and garnish with chopped crystallized or candied ginger.